From left: E.P. Carrillo Encore Majestic, Hoyo de Monterrey Epicure Especial, Alec Bradley Black Market Estelí Toro, Illusione Cruzado Short Robusto and Mombacho Liga Maestro Hermoso. A new batch of cigar ratings, which first appeared in the October issue of Cigar Aficionado, has just been added to our extensive online tasting database. Like all Cigar Aficionado tastings, this selection of handmade cigars varies in price, size and country of origin, but all are rated blind. Of the 83 cigars reviewed, three earned a rating of 93 points, the highest rating of this issue. While these cigars were from Cuba and the Dominican Republic, almost half of the cigars that scored 91 points or higher were made in Nicaragua, now the largest importer of cigars to the United States. The October tasting rated cigars in six sizes: Churchill, corona gorda, figurado, lonsdale, robusto and miscellaneous. 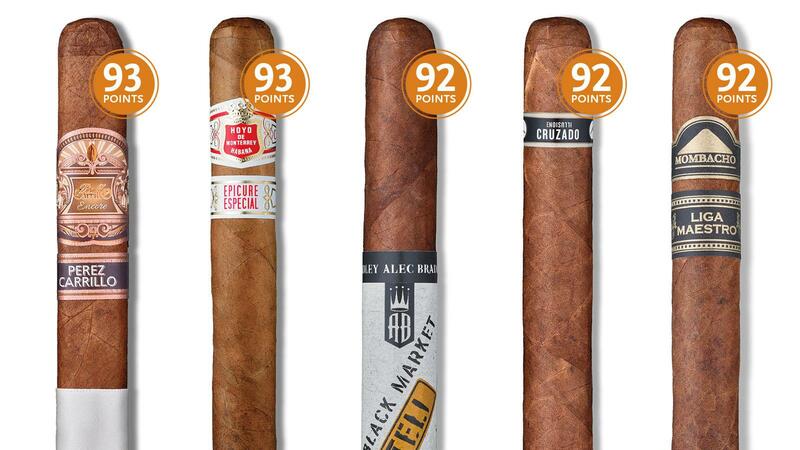 Of those, corona gorda performed best, with seven cigars scoring 91 points or higher.